A multi- purpose herb grown for its seeds and foliage. Dill originates from Eastern Europe and is much hardier than most people think. Fresh, frozen or dried, the ferny foliage and seeds are a tasty flavouring for fish, lamb, new potatoes and peas. Remember to add dill at the end of cooking, because cooking will destroy most of its flavour. It tastes very much like aniseed, so be sparing when adding it to food or it will overwhelm other flavours. Dill is tolerant of most conditions and easy to germinate, so it causes few problems for novice gardeners. Container grown or in the garden it is also a very attractive plant with wispy feathery leaves. Dill will grow well in most soils. Prepare the soil by digging to a spade and a half depth. The long tap roots of dill need to be able to grow without hitting solid soil. Incorporate some long lasting fertiliser, such as bonemeal, at the rate of two handfuls per square metre (yard). 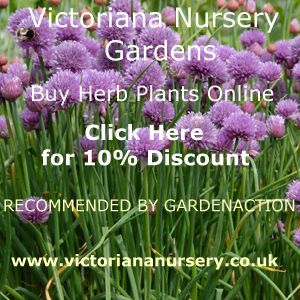 Dill is a perennial and therefore can last several years. However, it is only hardy down to about -4C, so it is sown from seed each year. Sow thinly in April , covering with only a fine layer of soil. The seedlings will emerge in two weeks or so, and should be thinned to 24cm (9in) apart. Further sowings can be made during the spring and early summer to extend the harvest time. The only care required is to keep the plants weed free. 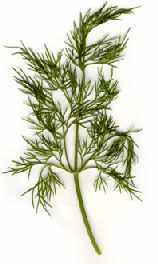 The long tapered roots of dill will ensure that it is unlikely to need watering in all but the most extreme dry conditions. Dill will produce wispy leaves growing on a single stem about 75cm (30in) high, which can be harvested about eight weeks after sowing. At this stage the plant will begin to produce flower heads, causing the leaf production to stop. In Eastern European countries, they grow dill principally for the flower heads (see picture on right) which are used to flavour pickled fruit and vegetables, especially gherkins. In the UK we mainly use the leaves of dill (see top picture) to flavour fish, lamb, potato and peas. The best way to harvest the leaves is to cut the plant down to an inch of its base as soon as there is any sign of the flower heads developing. With a little luck, the plants will re-grow to produce a second crop in late summer. Dill will keep well in the fridge for about three weeks, the remainder can be stored in the freezer in individual portions. Dill can be dried and stored in an air-tight container, but in our experience this causes it to loose most of its flavour. Dill is especially suited to container growing. For growing outside, use normal potting compost and keep the plants well watered. Dill will also grow indoors - sow the seeds indoors during October in 7cm (3in) pots. Transplant to larger pots when the plants are about 15cm (6in) tall. Keep the plants on a sunny windowsill (out of direct sunlight) and away from radiators. The plants will need to be supported with a stake - they will be ready for harvest about eight weeks after sowing. Message: I'm taking a Science course and my teacher wants the class to choose something to grow. I decided that I wanted to grow Dill, but I can't seem to find any information to help me with my assignment. Does anybody know specifically how to grow Dill? Message: My potted dill is 'yellowing' on the lower branches. 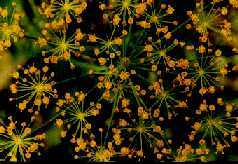 Message: After my dill flowers can I do anything to cause it to continue to produce leaves, or is it finished producing. Will it come up again next year if I leave it in the ground,And if so, do I cut it to the ground or just let it go to seed? Message: I just planted around 50 dill seeds 2 wks. ago. I am alreadying seeing most of the seeds turning into small plants! I have four hardy plants that I bought 3months ago. I still get tremendous leaves along with the flowers. Message: Dill has over taken my garden. Is their anyway to get rid of it besides pulling it out?